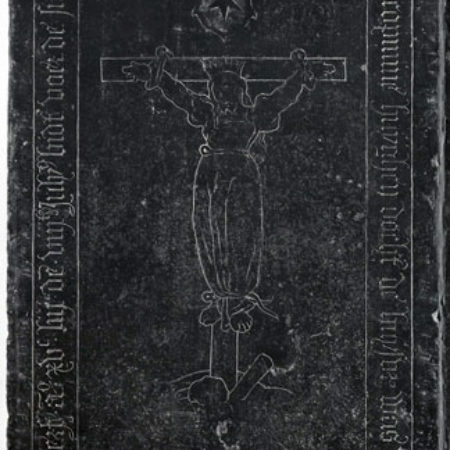 Floor slab of Jacopmine Huyghendochter, wife of Foert Christiaenszoon (d. 1553), Sint-Maartenskerk, Wemeldinge (province of Zeeland, Netherlands), Belgian hardstone, 185 x 114 cm. The Dutch coastal province of Zeeland is extraordinarily rich in medieval incised slabs. In some churches a large concentration of such slabs survive. 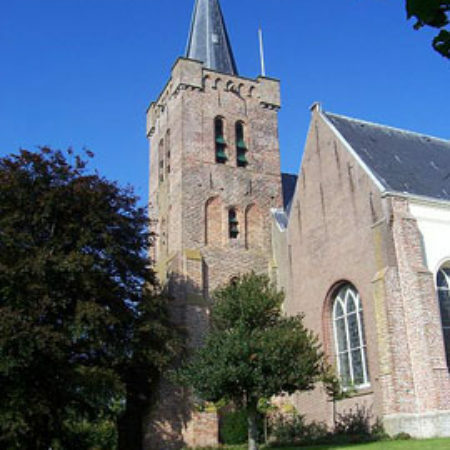 A good example is the Sint-Maartenskerk in the picturesque village of Wemeldinge, now in the municipality of Kapelle. An independent parish was founded here in the eleventh century or even earlier, making it probably the oldest in the region. 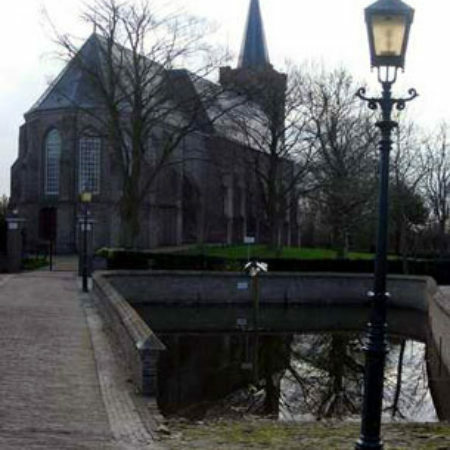 Yet the church is situated on the outskirts, rather than in the centre of Wemeldinge: a new dyke erected in 1134 to protect the area from the common threat of floods caused the inhabitants to move their village in that direction, away from the church. The church tower dates from the fourteenth century and the building itself from the fifteenth, with later modifications. Sixteen late-medieval incised slabs are still located in the former choir of the church. They would originally have been covered individual graves of people buried under the church floor, for intramural burial was customary among those who could afford it. However, the slabs are now placed against the walls, safe from the eroding effect of trampling feet, albeit that some had already suffered damage before. Six more slabs (or fragments) are located on the floor near the pulpit, which is nowadays situated in the nave. Hier leyt begraven / Jacopmine Huyghen dochter de huysvrouwe was van / Foert Cristiaens zoone / sterf anno XVc LIIJ den VIIJten Julyo bidt voer de siele. 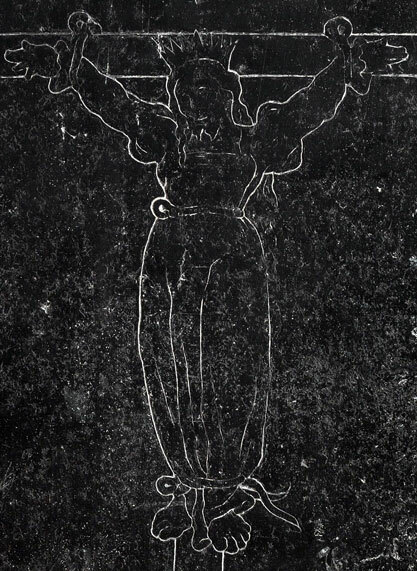 What makes this slab noteworthy is the incised figure in the centre, which is not a effigial image of the deceased, but represents instead a rather unusual female saint hanging on a Tau cross. 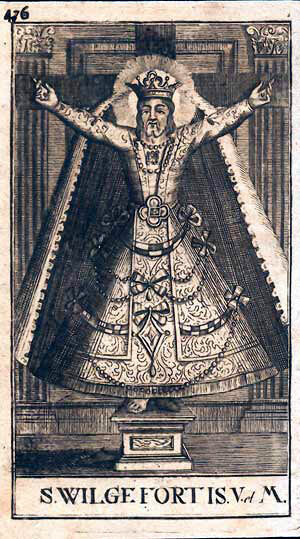 She is shown wearing a crown and a long dress with a girdle around her waist. Her feet are bare, and her arms and ankles are tied to the cross with ropes. Her long flowing hair indicates her virgin state. Yet the slab has suffered some wear and the most unusual aspect of her appearance is not immediately obvious: she has a forked beard. This crucified virgin martyr is known by a variety of names, including St Wilgefortis or Uncumber, Ontkommer (Dutch), Liberata (Italian), Librada (Spanish), Débarras (French), and Kümmernis (German). Her legend probably first appeared in the fourteenth century. The saint’s father is supposed to have been a pagan king of Portugal, but Wilgefortis converted to Christianity. When her father ordered her to marry a pagan prince, she prayed to God to help preserve her chastity, upon which she miraculously grew a beard on her chin. This successfully repulsed her suitor, but so enraged her father that he had sher crucified. The legend may have been inspired by a medieval misinterpretation of the famous Volta Santo in Lucca, which presents the crucified Christ with a crown and dressed in a long robe. St Wilgefortis was believed to help those who invoke her in their hour of death to die without anxiety, but she was also popularly venerated by women who wished to be ‘disencumbered’ from their husbands. Her feastday is 20 July. Why would a married woman have such a curious saint as the central feature of her tomb slab, especially as it was presumably her husband who commissioned her monument? A much plainer slab nearby commemorates Foert Christiaenszoon (d. 1569), who may have been Jacopmine’s husband. It is more modern in appearance with an inscription in Roman majuscules and roundels instead of quatrefoils, and also features a shield with an Agnus Dei carrying a banner and a six-pointed star below. The reason for showing St Wilgefortis on Jacopmine’s tomb lies in the name of her husband. 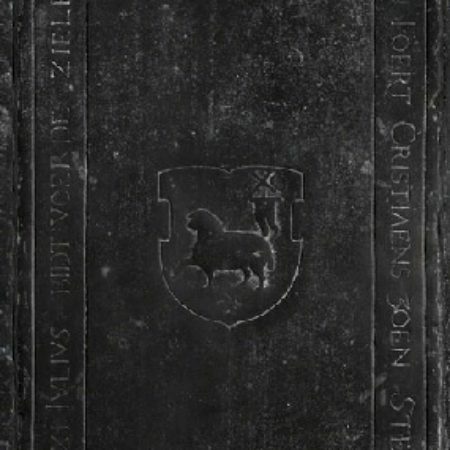 Foert, Foort or Fort is a popular regional variation of the saint’s name: it occurs on a number of slabs in the church of Wemelinge. Moreover, an altar in the church was dedicated to St Wilgefortis. It was not unusual for medieval memorials to feature name saints. Frank Greenhill illustratated three slabs in Zeeland with images of name saints, viz. St Gertrude of Nivelles on the slab of Gheertruyt Claesdochter Loets (d. 1539) in Hulst, St Adrian on that of Adriaen Cornelis Clayssenzoon (d. 1524) in Kapelle, and St Bartholomew (patron saint of butchers) on the slab of butcher Cornelis Piersen (d. 1538) in Biezelinge. There are more examples, and records of others no longer exant. Greenhill mentioned two fragments of the incised slab of the wife of Cornelis Wouterssen (d. 1531) in nearby Biezelinge: when last recorded these served as a doorstep to a nearby house and as part of a garden path. ● F.A. Greenhill, Incised Effigial Slabs. A Study of Engraved Stone Memorials in Latin Christendom, c.1100 to c.1700, 2 vols (London: Faber & Faber, 1976), vol. I, esp. 49, 195 (fig. 22), 305. ● G.J. Lepoeter, Kerk in perspectief. Verleden en heden van de Sint Maartenskerk te Wemeldinge (Kapelle/Wemeldinge, 1989). ● Hans van Dijk, ‘Vloerzerken in Zeeland. Vloerzerken met persoonsvoorstellingen, ca. 1300-1600’, 3 volumes, unpublished MA dissertation supervised by Dr Harry Tummers, (University of Nijmegen, 1989), esp. vols II (catalogue) and III (plates), nrs 147 (Wemeldinge) and 25 (Biezelinge). 1. 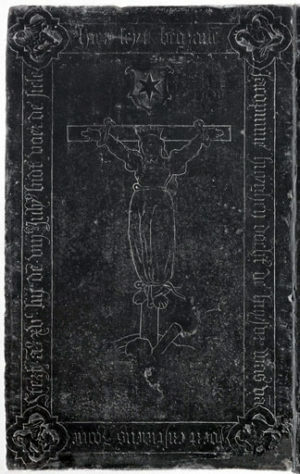 Floor slab of Jacopmine Huyghendochter, wife of Foert Christiaenszoon (d. 1553), Sint-Maartenskerk, Wemeldinge (Zeeland, Netherlands). Photo: Chris Booms, Rijksdienst voor het Cultureel Erfgoed (RCE). 2. 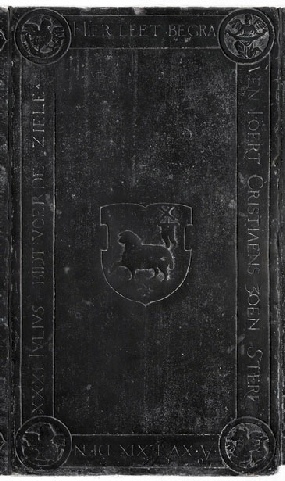 Floor slab of Jacopmine Huyghendochter, wife of Foert Christiaenszoon (d. 1553), Sint-Maartenskerk, Wemeldinge (Zeeland, Netherlands). Photo: Chris Booms, Rijksdienst voor het Cultureel Erfgoed (RCE). 3. 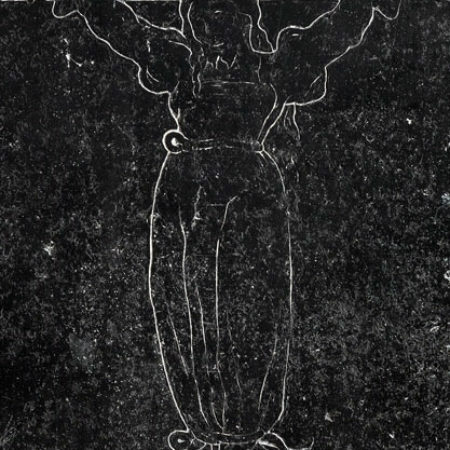 Detail of the incised image of St Wilgefortis on the floor slab of Jacopmine Huyghendochter, wife of Foert Christiaenszoon (d. 1553), Sint-Maartenskerk, Wemeldinge (Zeeland, Netherlands). Photo: Chris Booms, Rijksdienst voor het Cultureel Erfgoed (RCE). 4. 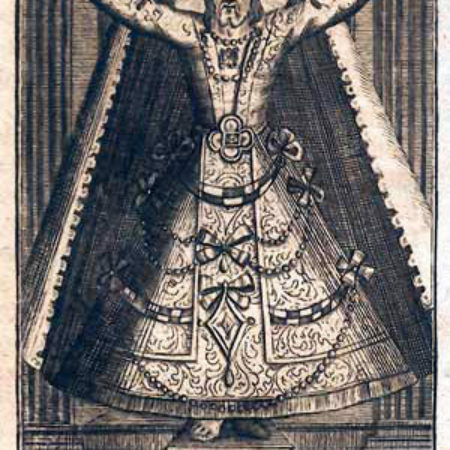 Post-medieval devotional print of St Wilgefortis. 5. 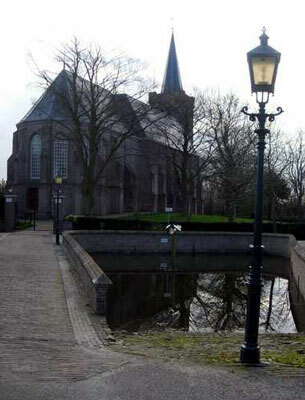 The exterior of the Sint-Maartenskerk, Wemeldinge (Zeeland, Netherlands). 6. 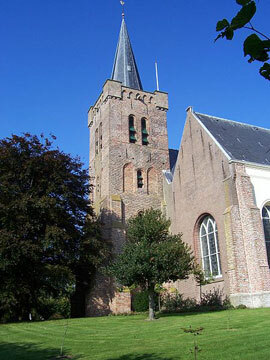 The exterior of the Sint-Maartenskerk, Wemeldinge (Zeeland, Netherlands).